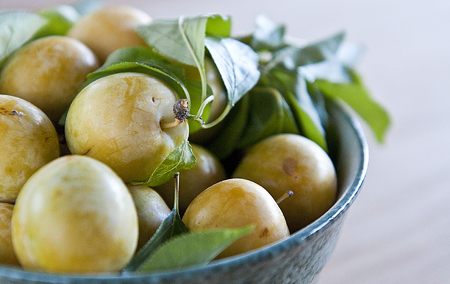 Greengage plums have a honeyed sweetness to them when they are ripe. This is a sort of coffee cake type dessert – it’s also a great brunch item with Greek yogurt. The plums sink into the dough in the cooking and impart their flavours throughout. It works with any kind of plums – I did it with a mixture of greengage, Italian and Santa Rosa the last time I made it. Preheat the oven to 350F/175C. Grease a 9 inch/23 cm glass pan or pie plate. Beat butter and sugar together till creamed. Add eggs one at a time and stir till well mixed. Combine flour, baking powder,, salt and 1/2 tsp cinnamon together, then blend into egg mixture. Mix together sugar and cinnamon for topping and squeeze lemon for juice. Spoon batter into pan and place plums, skin side up in a pattern over dough. Lightly sprinkle torte with cinnamon sugar and lemon juice. Bake for 1 hour or until springy when touched. Let cool to lukewarm, then serve with Greek yogurt, whipped cream or ice cream. This torte can also be frozen; thaw out to serve, and warm at 300F/150C for about 5 mn.